Chorizo Breakfast Tacos. Saturday morning breakfasts are usually more filling at my house than the quick weekday on-the-go breakfasts. On the weekends, I like to cook a hearty breakfast since we’re usually busy and don’t always find time for lunch. 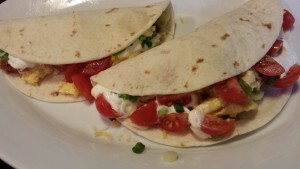 My Chorizo Breakfast Tacos — flour tortillas stuffed with scrambled eggs, chorizo, cheese, green chile salsa (salsa verde), sour cream, cherry tomatoes, and scallions — meet our “stay-full longer” challenge. These breakfast tacos are simple. I like to use Niman Ranch or D’Artagnan Chorizo sausages which I slice into rounds and then slice each round into quarters. You can use fresh ground chorizo as well. Saute the chorizo in a non-stick pan until it’s cooked and browned. Remove the chorizo from the pan to a small bowl and keep warm. 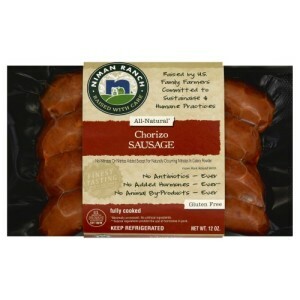 You can find Niman Ranch Chorizo sausages in the refrigerated meat section at Whole Foods Markets. 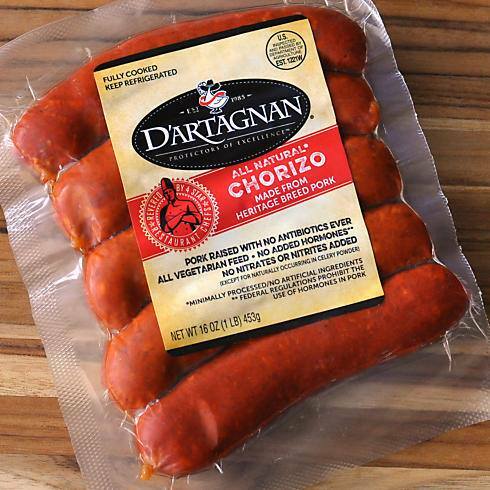 D’Artagnan chorizo sausages are available at select Giant Food stores or online. Whisk some eggs in a bowl and cook them in the same non-stick pan. When the eggs have set into curds and are cooked, add the chorizo to the eggs and stir. Add a little shredded cheese to the mixture, stir, set aside, and keep warm. Cut some cherry tomatoes into quarters and slice some scallions. Warm some fajita-size flour tortillas in foil in the oven for 3 – 4 minutes at 300 degrees Fahrenheit. When the tortillas are warmed, remove them from the oven and divide amongst serving plates. Spoon some of the chorizo egg cheese filling onto each tortilla. Top with additional shredded cheese, salsa verde, sour cream, cherry tomato quarters, and scallions. Sprinkle with chopped cilantro. Fold over the tortillas into tacos, and serve! If you have leftover chorizo, egg, and cheese filling, just refrigerate it for up to two days for another meal. I like to use leftover filling in a burrito-size flour tortilla and roll it up like a burrito. Also, you can use the filling to stuff enchiladas. Just smother with my Red Enchilada Sauce and bake for 15 minutes at 400 degrees Fahrenheit. 1. Warm your oven to 300 degrees Fahrenheit. 2. Wrap the tortillas in aluminum foil, two per foil package. Set aside. 3. Slice the chorizo sausage into rounds and then slice the rounds into four quarters. 4. In a non-stick skillet, saute the chorizo sausage until cooked through and browned. Remove to a bowl and keep warm. 5. Whisk the eggs in a bowl. 6. Melt the butter in the same non-stick skillet that you used to cook the chorizo. You’ll also use the bit of grease left from the chorizo which adds extra flavor to the eggs. 7. Cook the eggs in the butter in the non-stick skillet, stirring until they are set. 8. Warm the foil-wrapped tortillas in the oven for 3 – 4 minutes. 9. While the tortillas are warming, dd the chorizo to the eggs and add 1/2 cup of the shredded cheese mix. Stir to combine and warm through. 10. Remove the tortillas from the oven and divide amongst serving plates. 11. Divide the chorizo egg mixture amongst the tortillas, piling down the middle of each tortilla. 12. Divide the remaining shredded cheese mix over the chorizo egg mixture. 13. Divide the green chile salsa, sour cream, quartered cherry tomatoes, and sliced scallions amongst the tacos. 14. Sprinkle with the (optional) chopped cilantro. 15. Fold over the tortillas into tacos and serve! Makes 8 breakfast tacos. 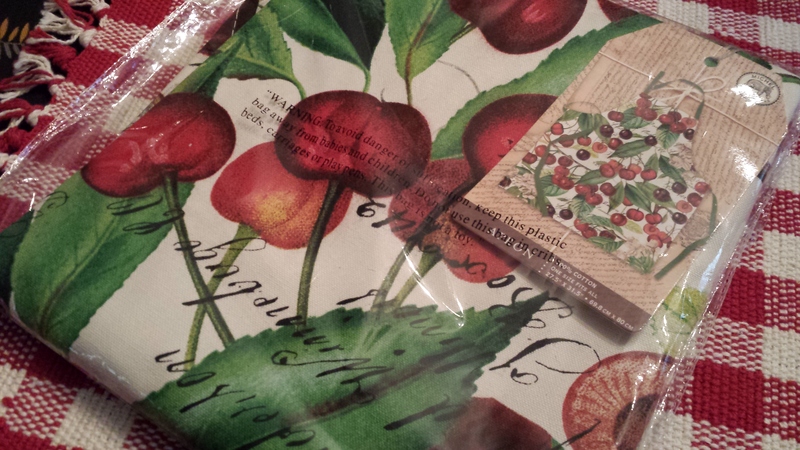 Serve with my Minty Fruit Salad or my Fresh Fruit Platter on the side. These tacos should be eaten immediately. Leftover filling can be refrigerated and reheated up to two days later. You could add all of the ingredients to a Breakfast Taco Bar and let your guests assemble their own breakfast tacos. Variations: You can use Egg Beaters in place of the eggs. 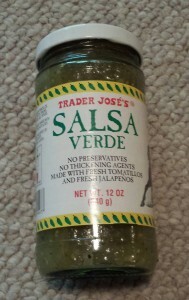 Try a red salsa instead of the salsa verde. Add some sliced or diced avocado and shredded lettuce to the tacos. 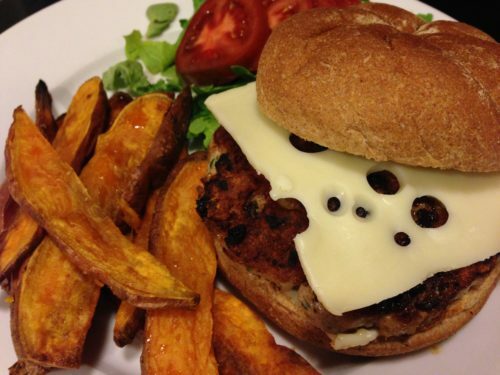 Substitute cooked ground meat with taco seasoning for the chorizo. Add some black beans to the chorizo egg mixture while warming in the pan. 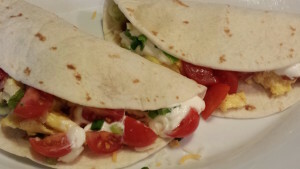 You could use the hard corn taco shells for this dish if you like a crunchy breakfast taco. I don’t recommend the soft corn tortillas because they tend to fall apart easily even if they are doubled per taco. Use the chorizo egg filling to stuff enchiladas, cover with my Red Enchilada Sauce and shredded cheese, and bake for 20 minutes at 400 degrees Fahrenheit.